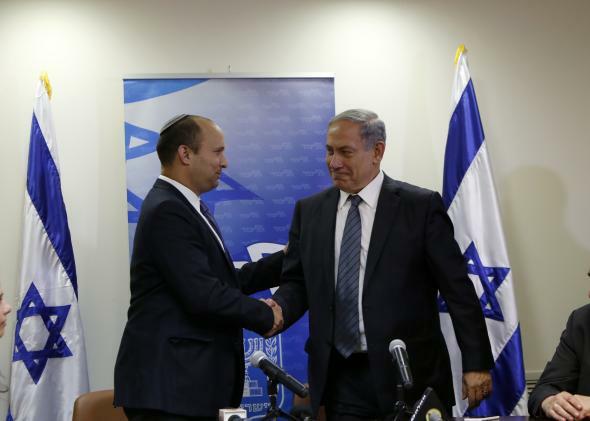 Israeli Prime Minister Benjamin Netanyahu shakes hands with Naftali Bennett, the head of the right-wing Jewish Home party on May 6, 2015, to announce the formation of a coalition government. Just minutes before the deadline, and nearly two months after his much bigger than expected election victory, Israeli Prime Minister Benjamin Netanyahu finally has a government. The announcement came after a late night negotiating session between Netanyahu’s Likud party and the right-wing Jewish Home party. The ultra-Orthodox parties Shas and United Torah Judaism had already signed on to Netanyahu’s coalition, as had the center-right, economically focused Kulanu. Ideologically, this is the kind of hard-right coalition Netanyahu probably had in mind when he dissolved his last government and called for elections in December. It also makes clear that, despite his attempts to walk it back, he meant what he said in the closing days of his campaign about there not being a Palestinian state as long as he’s prime minister. With Jewish Home’s inclusion, the government is also more likely to push a controversial law making it harder for NGOs to receive foreign funding, a measure likely to mostly effect left-leaning human rights groups who receive much of their funding from abroad. The big surprise of the coalition is that former Foreign Minister Avigdor Lieberman’s ultra-nationalist Yisraeli Beiteinu party is not a part of it. Lieberman, who draws much of his support from secular Russian immigrants and had pushed to make military service mandatory for orthodox Jews, didn’t want to sit in a coalition with the two ultra-Orthodox parties. Plagued by corruption scandals, Lieberman had lost significant support in the last election and Netanyahu probably won’t be too sorry to be rid of him, but without Yisrael Beiteinu, he has only the bare minimum 61 votes necessary for a majority in the 120-seat Knesset. There will also be ample opportunities for rupture within the coalition. For one, Kulanu, whose leader Moshe Kahlon will likely be finance minister, opposes the controversial Nationality Bill, pushed by Jewish Home to emphasize the Jewish identity of the Israeli state, which critics say is anti-democratic and discriminatory to non-Jews. The bill was one of several factors that tore apart Netanyahu’s last coalition. The White House put out a perfunctory statement saying that President Obama “looks forward” to working with the new government, but Netanyahu’s narrow—both in the ideological and numerical sense—coalition is likely to only increase Israel’s diplomatic isolation. On the other hand, it probably won’t last that long.